Take a moment to wander the art of Morten Haug, whose cover photograph (one of ECM’s best) is a gateway into what’s to come. Like Edvard Munch’s The Scream mummified, it silences that which is already silent, and in so doing unleashes a slow torrent of organic music. As the rain of Iro Haarla’s harp trickles through the branches of “The Wind,” picking away the last crumbs of our disbelief, we are able to ease into the careful telepathy this ensemble braids together. Thus blown of our dust, we meditate in “Frozen Melody,” which, though it may begin in stillness, melts with every rendered note. “Calypso Bulbosa” is a rougher diamond, freshly unearthed, the grunge of an electric guitar still clinging to every clouded knurl. Birdcalls and flightless reeds share the same forest, twisting into all manner of distorted reflections. After sailing through the elliptical orbits of the “Third Moon,” we reach the title track, which indeed brings light to bear, cloud-shafted and wavering. The saxophone work here, and in the “Camel Walk” (Vesala’s own “Donkey Jamboree”) that follows, is gorgeous, watery, silted. “Fingo,” no dissimilarly, sounds like a Bill Frisell tune blended in a sonic food processor with Dino Saluzzi spice and a dash of late-night cabaret. A brilliant inclusion. The album’s briefest spit comes in “Early Messenger,” and brings us “Together” in the full-circle closer, interlacing creative fingers in the full dark of finality. Another puzzling masterpiece from Vesala. Savor it as you will. This is an interesting release….the track “The Wind” is reworked, first heard on Nan Madol. Both versions are memorable. The Penguin Guide to Jazz gives this release it’s highest recommendation and calls it essential. I am not so sure – Vesala’s music is certainly an acquired taste! I find much to admire in this album, to be sure, but I do think that Nan Madol is a deeper dive (if not a higher float!). First EV I heard. The dates after ‘Lumi’ were generally harder to penetrate for me: often they are dense and implacable. But this one is much more accessible for all its occasional angularity. 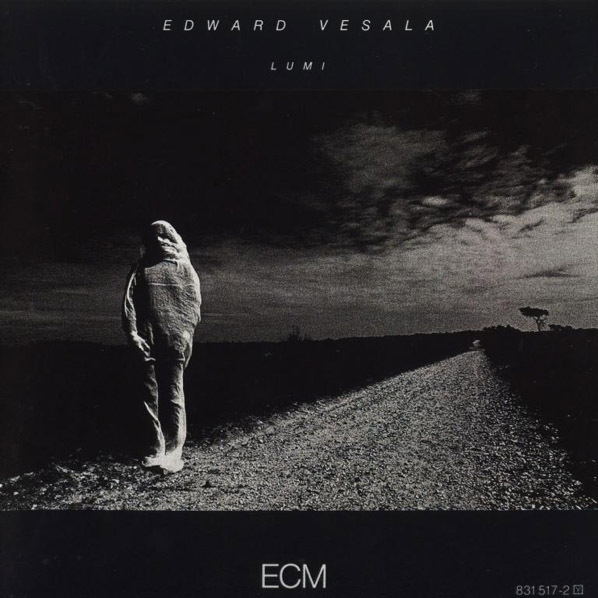 That certainly is a high-point in ECM’s covers too. The earlier version of ‘The Wind’ on ‘Nan Madol’ has a much more “deep deep forest” vibe, whilst ‘Lumi’s chimed perfectly with the muddy, boggy Wintry plains of where I was living back then. Thank you for the insightful comments, Reimer. I agree that Lumi is among the more accessible EV efforts, and one that I would recommend, along with Nan Madol, for those new to his sound.